‘Twas a victorious weekend in conference play for the South Siders. Chicago hosted NYU during Neon Night in the first game of a men’s-women’s doubleheader. The stands were full of screaming students in bright colors supporting the Maroons (9–5, UAA 2–1). “We had a really good crowd, which made it easy for our guys to get excited for the game,” said fourth-year forward Charlie Hughes. Fourth-year guard Derrick Davis agreed. “Neon Night was awesome for the team. It brought so much energy and spirit into the gym. Hopefully the next Friday night home game can match, or possibly surpass, Neon Night in energy and excitement,” Davis said. That excitement was evident as the Chicago defense stood strong against NYU (11–3, 1–2) resulting in a 58–50 win, which also marked the Violets’ third consecutive loss to the Maroons. The game was low-scoring, as predicted, as both defenses put up a strong front to their opposing teams. Regardless, Hughes, fourth-year forward Sam Gage, third-year point guard Royce Muskeyvalley, and second-year shooting guard Jordan Smith were standouts offensively. Following their victory over the Violets, the Maroons took on Brandeis at home on Sunday. The South Siders’ game against the Judges (8–6, 0–3) saw success as well. Sunday’s game had a much quicker pace than Friday’s, pushing Chicago to pick up its offense. 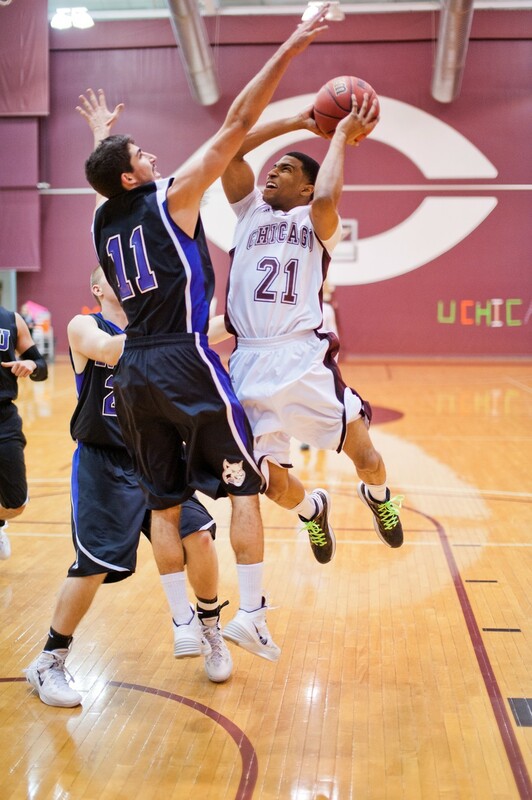 The Maroons took home an 85–75 win. “The biggest thing we did last weekend on the court was shutting down NYU and Brandeis’s best players,” Hughes said. Hughes also mentioned how Sunday’s game saw a lot of action from players who don’t normally get the chance to shine. Some notable shots included three-pointers from second-years Eric Robinson and John Steinberg, who generally get some minutes off the bench. “These two wins are only a starting point for us during conference play this year. We have a goal, and to reach it, we will need to carry the momentum that last weekend gave us into our road trip this weekend. As a team, we want to get better with every game we play, and last weekend we accomplished that,” Davis said. This weekend, the Maroons are competing on the road in Pittsburgh and Cleveland to play the Carnegie Mellon Tartans (9–5, 2–1) and Case Western Spartans (9–5, 1–2). The Maroons will face the Tartans at 7 p.m. tonight and Case Western at 11 a.m. on Sunday.